Gulf Power is making preparations for Hurricane Michael and encourages its customers to be prepared as well. The latest forecast projects landfall somewhere between Pensacola and Apalachicola as a category 2 or 3 hurricane Wednesday afternoon. 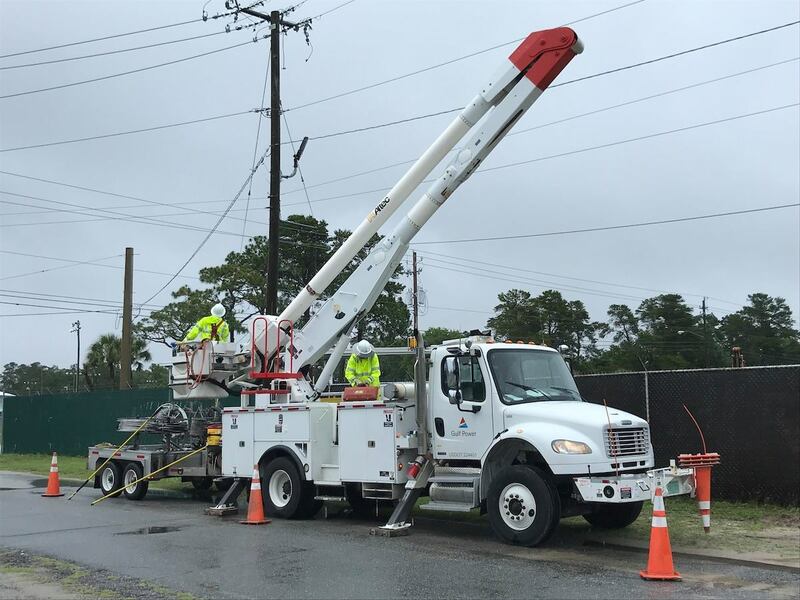 Gulf Power crews restore following Tropical Storm Alberto. Gulf Power is making preparations for Hurricane Michael and encourages its customers to be prepared as well. The latest forecast projects landfall somewhere between Pensacola and Apalachicola as a category 2 or 3 hurricane Wednesday afternoon. On the current track, tropical storms force winds could extend as far west as Pensacola, with the greatest impact to the Panama City area. With the threat of major hurricane and widespread power outages due to wind, rain and tidal surge, Gulf Power crews stand at the ready to restore power. Nearly 1,200 Gulf Power employees and 330 Gulf Power contractors shift to storm duty roles to restore power when a storm hits to ensure power is restored as quickly and safely as possible for their customers. The company has also lined up assistance from other energy providers. Already, more than 1,350 outside resources have been secured to assist with restoration and more are available if needed. This will be the third storm to hit Northwest Florida this year. In May, Pensacola experienced subtropical storm Alberto, the first named storm of what has proven to be a very busy storm season. And in September, Gulf Power crews restored power to 26,000 customers after Tropical Storm Gordon lashed the area. However, Hurricane Michael is a much stronger storm than Gordon and customers must prepare their homes and families to be ready for power outages that could extend more than a few days. Because of the storm, Gulf Power has postponed its annual Economic Symposium this week. · To get the latest updates on outages, customers can download Gulf Power’s app and access the outage map for the latest restoration information. The app is free and available for iPhone and Android. Just search for “Gulf Power” in iTunes or the Google Play Store. · Sign up for free PowerOut alerts through your cell phone by texting REG to MyGulf (694853). Or, visit the Preference Center in the My Account area of MyGulfPower.com to choose whether to receive texts alerts, emails or phone calls with outage updates. · Gulf Power knows when your power is out. However, you can call 1-800-487-6937 if you have any questions about your outage. · Turn your air conditioning down to cool down your house. If you keep the doors and windows closed after the storm you can keep your house relatively cool for about 48 hours after the storm. · Charge up your cell phone before the storm — and anything else that needs to be charged up. · Keep freezer doors closed and sealed. Well-filled freezers keep most foods frozen two to three days if the door is kept closed. Turn your refrigerator and freezer to the coldest settings and pack your freezer with as many food items as possible. · Be prepared to disconnect or shut off any appliances that will turn on automatically when power is restored, including electric space heaters and stoves, washers, dryers, TV’s, microwave ovens, computers, refrigerators and freezers. If not, when power is restored, several appliances may come back on at the same time and overload your circuits, or hot appliances may come on while you’re away or asleep, posing a fire hazard. · Unplug electronics in your home and place them on sturdy surfaces or relocate them to the highest floor. · When traveling before or after a storm, be aware of electrical crews working and the potential for down power lines or power poles. It is very important to stay away from downed power lines, and remember some could be hidden under debris after a storm. · If someone in your home is dependent on electric-powered, life-sustaining medical equipment, review your family emergency plan for backup power or make arrangements to relocate when a storm warning is issued. · If you plan to use a ladder while preparing your home for a storm, note the locations of power lines before you begin. Be sure that ladders or scaffold are far enough away so that you – and the ends of the tools you’re using – stay at least 10 feet away from the power lines. Before lowering a TV antenna or satellite dish, make sure to turn off and unplug the TV. · Most counties will suspend trash and debris pickup before a storm. Please do not trim trees now, as high winds can turn cut branches into dangerous, flying debris. However, if you already have trimmed trees, please help to prevent outages by tying down or securing loose branches and other debris. · See more preparation and safety tips here. · Customers can get more detailed storm preparation information on the Gulf Power Storm Ready Center webpage. Please share this “How Gulf Power restores power” video at https://t.co/PhEzt4Ajmc.